I originally saw this recipe in Cooking Light magazine. This publication never fails to provide good quality recipes that need little or no modification. The same holds true for this Almond Stuffed Chicken. Since this is featured on the 5-ingridients or less page, you know it makes for an easy weeknight meal. With lean meat, nuts, fresh herbs, and a light cheese, it also gives you a healthy variety of flavor. This is one of my go-to weeknight meals. For this recipe, I pretty much used the exact same recipe that was published in Cooking Light. The only slight modification I made was to add a little olive oil to the butter when sautéing the chicken because I felt it needed a little more to prevent burning in the pan. I also sear both sides of the chicken and finish in the oven. I swear by this method for chicken breasts. Last but not least, don’t forget to toast the almonds! I have made it both with toasted and untoasted and the nuttier toasted almonds add so much to the dish. Enjoy! How to toast almonds: Heat a small skillet over medium heat. Add almonds to pan. Stir or use the pan to flip almonds every minute or so. This will encourage even browning and prevent burning. Nuts burn easily so watch carefully! Combine cheese, 3 tbsp almonds, 2 tbsp parsley in small bowl. Set aside. Cut a slit through the thickest portion of each breast to form a pocket. Secure each pocket w/ a wooden toothpick. Season chicken with salt and pepper. Heat butter and oil in non-stick, oven-safe skillet over medium heat. Add chicken and cook 2-3 mins on each side or until browned. Finish cooking chicken in oven until a meat thermometer inserted into the thickest portion of the breast reads 165F (10-15 minutes). 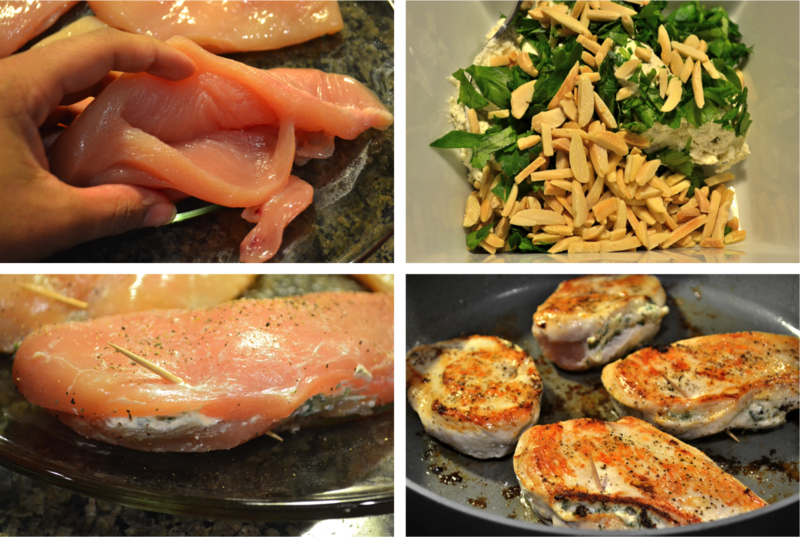 Top chicken w/ remaining almonds and parsley.